No Man’s Sky was our most anticipated release of 2016, and now here we are, back on the hypetrain 2 years later. Why? Because “NEXT”, the game’s biggest update yet, was launched on July 24th. No Man’s Sky NEXT is a free update for PC and PS4 players as long as you own the base game, and it will finally bring the full multiplayer experience that fans all over the world have been waiting years for! If you don’t own the base game yet, pick it up here while it’s still on sale, and you’ll get the update for FREE. 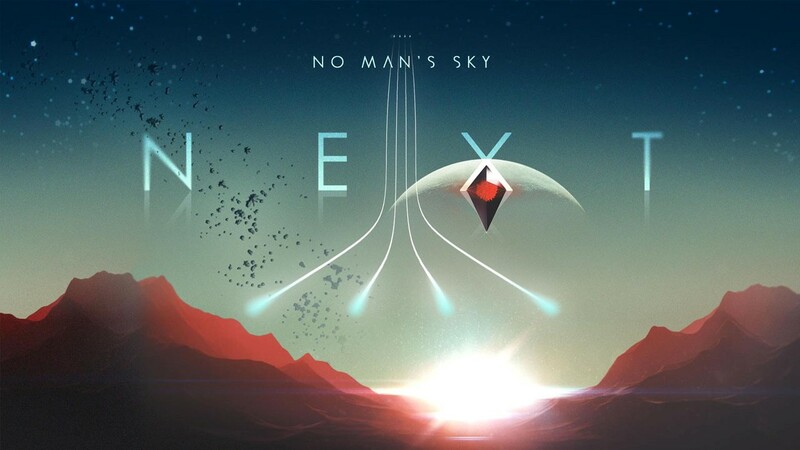 The NEXT update for No Man’s Sky basically brings us the full release of the game that was promised at launch. Like a phoenix rising from the ashes, the past two years of intense outrage, praise, feedback, and death threats (see below) over No Man’s Sky has amounted to the equivalent of two years of early access beta testing, and the game is about to be better than ever. Check out the trailer for NEXT and the list of features further in this post to learn about the new multiplayer experience and everything else that the update will bring. And read on to find out more on how No Man’s Sky became one of the most notorious games ever made. No Man’s Sky was not exactly well received on the day it launched. The game was known as “One Man’s Lie” by disappointed fans, and its launch in August of 2016 was immediately followed by hundreds of negative reviews, demands for refunds, and general outrage over the fact that much of what was promised by game director Sean Murray in the months leading up to the release was flat-out untrue. Some upset fans took it even further. Murray told The Guardian: “I remember getting a death threat about the fact that there were butterflies in our original trailer, and you could see them as you walked past them, but there weren’t any butterflies in the launch game.” People were really mad. Since that rocky release, the developers have really listened to players and added a number of tweaks, update patches, and free expansions which have made some people happier, but have not boosted the game’s overall reputation much — it’s sitting at a score of 61 on Metacritic, with a user score of 2.6 out of 10. Actually, the vast majority of people were saying really simple things to us. They were saying “Oh, I love the game” or “I want to love the game, but I don’t like your inventory system or I don’t like the way launch fuel works or I want a creative mode. I want base building! Or I want this other thing from this game. I want this way for the discoveries page to work or whatever.” It’s like, oh my god, that sounds fine. I can do that! 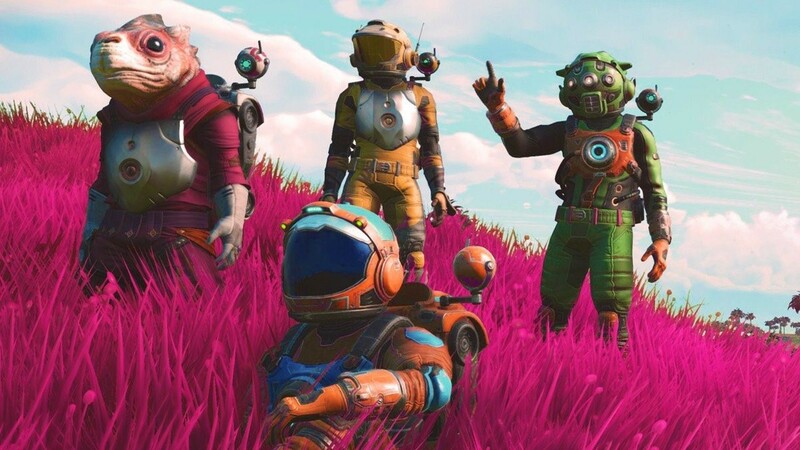 No Man’s Sky NEXT should be the update that we’ve all been waiting for: multiplayer for the outraged gamers who bought it (or refused to) at launch, and TONS of updates and new features for fans who are already familiar with the game. So, gather your friends (or search the universe for new ones! ), and get ready for what Murray describes as “Star Trek away team” style exploration! ● Help others survive and thrive, or steal their resources like a dastardly space pirate. ● The bases that you build with your team can be used, added to, or destroyed by any of your teammates. ● Mid-space battles should be a lot more epic as you are now able to fight alongside your friends. ● Now you can relive the Star Wars pod racing scene with the option to race exocraft and even build your own tracks — all shareable with other players. ● Now the whole game can be played in first OR third person, whether you’re on foot or in the cockpit. ● In addition to planets and outer space features, NPCs, structures, and all spacecraft are promised to be significantly more detailed. ● Bases can now be significantly larger and more complex thanks to the addition of hundreds of new building components. ● You are now able to build anywhere your heart desires on a planet. ● You and your team can now own more than one base. ● From the bridge of your own ship you can now control an army of freighters to command at your will. ● Send your freighters out to search for resources in the vast beyond or give them specific tasks within a system you’re exploring. ● Improved freighter base building allows a truly custom capital ship. ● Build one of those new, complex bases on one of your freighters and develop a flying, space-travelling empire! ● And of course, with the new multiplayer experience, your friends can come along for the ride. When you start up the game, you’ll also notice changes like longer draw distances, a new cloud system, and more realistic animal behaviors that enhance the “space tourism” angle of the game. To keep you entertained, weekly content drops and community missions are also planned! And if you’re new to the game, the developers have made starting fresh better than ever by pushing many of NMS’s coolest features sooner in the game. With NEXT you won’t have to play 30 or 40 hours before you get to all the fun stuff. “This time around, we’ve thought a bit more about the person who has never played the game before or just wants to start a fresh save,” Murray told Waypoint. So, pick up the game while it’s on sale, and before all the cool planets get claimed/named by other explorers. Maybe we’ll see each other out there in that infinite, procedurally generated universe… I’ll be on planet “CD Keys”, filled with creatures named “great deals”.